Get a quick-and-easy connection to your desktop PC via this USB / Serial desktop cradle. 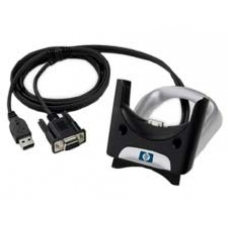 Transfer files and synchronise your iPAQ handhelds address book, schedule and more with your desktop PC by connecting this cradle to the USB or serial port. If using the USB connection you can also charge your battery every time the iPAQ Pocket PC sits in the cradle, connecting via the serial port will require an AC adapter for charging (not included). * USB / Serial Port Connectivity. * HP Part FA123A, 250182-B21. * Spare Part Number 308096-001.